For some wholesaler newbies, finding their first deal can be real challenging. However, when you have the right mentors, finding and closing one deal after another should come easy. Yes, even for newcomers like Robert Antonie. Robert is a relentless new tribe member from Memphis, Tennessee. Even if he’s only been wholesaling for 4 months, he has done something truly awe-inspiring—he has closed his first deal and has 2 more in the pipeline. All in all, he’s bound to earn a total of $21,500 from the 3 deals. That’s pretty impressive for someone who has only been wholesaling for 4 months! 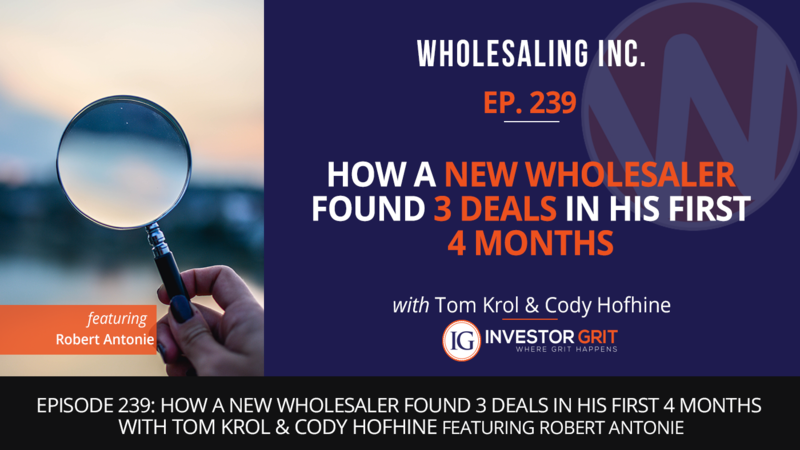 If you are new to the wholesaling world, you’d love today’s episode. You will not only get winning ideas on how to find and close one deal after another, you’ll also discover the role the right mentors will play in your wholesaling success! Robert consistently sent out 2,500 postcards every week to the tax delinquent list. From there, he got a call from a really motivated seller. After scheduling an appointment, he immediately visited seller the next day. Rather than talk about the property right away, Robert chose to talk to the seller first and find out how he can provide value and be of service. After all was said and done, he was able to purchase the contract for $17,000, sell it for $24, 500, and walked away $7,500 richer!